Living a Fit and Full Life: Travel Light with Mirabella Beauty's Pressed Powder Foundation Made Mini! Travel Light with Mirabella Beauty's Pressed Powder Foundation Made Mini! There’s a reason this product is our all-time best-seller, now in a convenient travel-size. There’s a reason this product is our all-time best-seller, now in a convenient travel-size. Mess-free formula is packed with natural vitamins and minerals that offer anti-aging properties while perfecting skin. Available in shades II, III, IV. 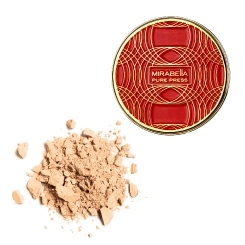 Travel light with Mirabella Beauty's Pressed Powder Foundation made mini! Can I just first say how beautiful this little compact is! 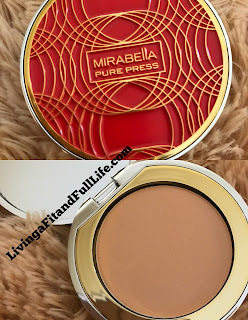 I absolutely love the cute compact but what I love the most is the coverage I get from Mirabella Beauty's Pressed Powder Foundation. Another terrific thing about this Pure Press Travel Size is that it's packed with natural vitamins and minerals that offer anti-aging properties while perfecting skin. This is something I can attest to because my skin looks healthier since I've begun using it and I have far less breakouts. Mirabella Beauty's Pure Press Travel Size is terrific for traveling or tossing in your purse for touch ups on the go and I highly recommend it!